St. Mary’s Ecumenical Institute (EI) was founded in 1968 as part of St. Mary’s Seminary & University, America’s oldest Roman Catholic seminary, in cooperation with ecumenical leaders. St. Mary’s is accredited by the Association of Theological Schools and by the Middle States Association of Colleges and Schools. St. Mary’s Ecumenical Institute invites people of all denominations into the journey of theological study. Our ethos is one of seeking wisdom, nourishing faith, engaging community. Our student body of women and men is both interdenominational and interracial, as is our excellent faculty. Nearly all of St. Mary's Ecumenical Institute's professors have earned doctorates, and a significant number are well-known published scholars. The faculty is drawn from neighboring academic and religious institutions as well as from St. Mary's. St. Mary's Ecumenical Institute has a rolling admissions policy. Students may apply at any time for admission by submitting the appropriate materials. 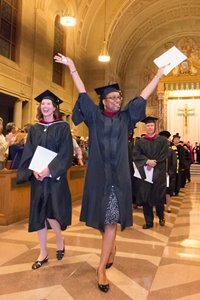 St. Mary’s Seminary and University: Accredited by the Commission on Accrediting of the Association of Theological Schools in the United States and Canada, with the following degree programs approved: Master's in Divinity, Master of Arts in Theology, Master of Arts in Church Ministries. Accredited by the Middle States Commission on Higher Education, with the following degree programs approved: Bachelor of Arts, Master of Divinity, Master of Arts in Theology, Master of Arts in Church Ministries. There are a number of different ways of making a gift, whether during your lifetime or as a legacy.